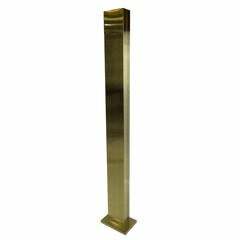 Part of the Monolith series, this lamp is defined by sleek lines and imposing proportions. 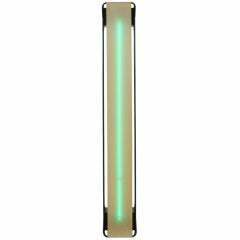 Handcrafted of wood with a dark finish, the tall, vertical base is topped by a semi-circular "shade" enclosing the light source. 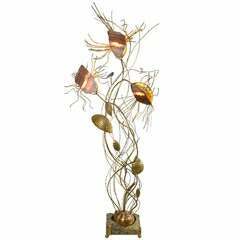 Diffusing warm reflections in any room, this functional artwork was ideated as a "twin lamp," therefore it is suggested to purchase it in a set of two to reflect the artist's intended display. The unique texture results from a special technique, whereby the color is applied with a "comb" and subsequently brushed and polished. 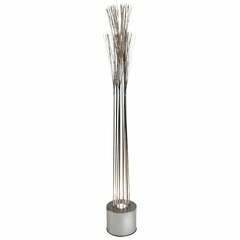 Wonderful 1970s chrome sculptural accent piece, with 12 rods arranged and a circular pattern, topped with Bertoia-style sprays, and lighted from below. C. Jeré/Artisan House. A, one-of-a-kind lighted steel sculpture of the Empire State Building signed with a Little Dipper.